There’s been something of a backlash against the organic food movement in recent months, brought on by a new found frugality in the face of the deepening economic crisis. People see organic food as just too expensive, a luxury they simply can’t afford. The taste and quality argument is easy to win – organically grown food does taste better – but the cost argument is more difficult. If people are feeling stretched, they’ll push the food budget as far as it’ll go, and an obvious target is to cut back on things that look like luxuries. I decided to cost out a typical fruit and veg box from Abel & Cole, one of the clear market leaders in the box scheme business. The box I received* was a Mixed Organic Fruit & Veg box, which retails at £15.95 and should provide enough fruit and veg for two or three people for about a week. I decided to look at the box from three angles – cost, quality and convenience. £15.95 seems pricey for a box of fruit and vegetables, but is it? * Sainsbury’s watermelons were huge, Abel & Cole’s were small. Halving the cost seemed fair. ** A pack of three larger courgettes seemed about the same size as those in the Abel & Cole box. *** Abel & Cole’s onions were small – three large onions from Sainsbury’s is about comparable. So, £15.95 from Abel & Cole, £15.60 from Sainsbury’s. Slightly cheaper from the supermarket, but Sainsbury’s didn’t have an organic alternative to two of the items in Abel & Cole’s box. The premium for organic produce over normal is about a fiver. I’d call that a draw. Abel & Cole really shone on quality. Let’s start with the box. Cleverly designed, the box has an internal divider that separates fruit and salad from dirtier root vegetables. The box was small enough to look nicely packed and full up. The produce itself was first rate. Nothing was bruised, broken or showed any signs of mishandling. The nectarines were rock hard an tasty, the carrots crisp and not at all ‘bendy’. The red pepper was wrinkle free. Only the lettuce showed signs of wear, having sat on my doorstep for a while. Even then, the heart of the lettuce was crisp. A couple of potatoes had had a slight altercation with a slug or two at some point, but keeping organic potatoes pest free is virtually impossible. My home grown spuds normally come out of the ground with significantly more damage. Organic food costs more, there is a premium involved, but the extra cost brings extra taste and quality. 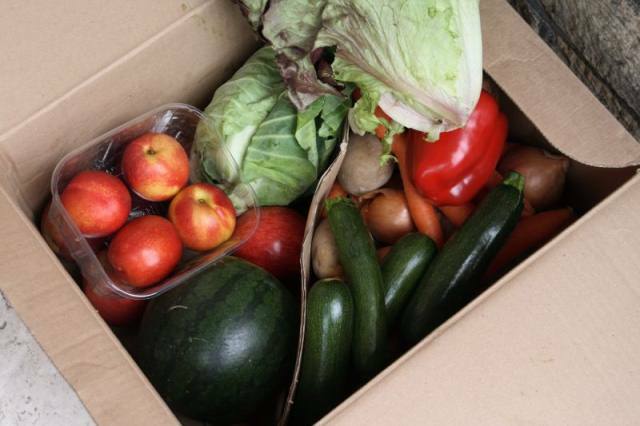 Having a box of fruit and vegetables regularly delivered to your doorstep is obviously convenient, but the big problem with most box schemes is that you get what you’re given, whether you like it or not. Sometimes that means cauliflower after cauliflower, week after week, with no end in sight except maybe a change in the season. I like to be challenged by the contents of a veg box. I like peering inside and having one of those ‘what the hell am I going to do with that?’ moments. Sometimes I have ‘what the hell IS that?’ moments. You have to be inventive. You have to look things up, search out a recipe, come up with an idea. It’s part of the fun, but if there’s something I just don’t like, I won’t use it, and it’ll go to waste. Abel & Cole’s answer to this is the Internet, and a neatly designed website that allows you to tweak the contents of your box, marking the things you like and the things you don’t. You could avoid cauliflower for ever, if you wanted, and I definitely do. Abel & Cole’s produce is excellent, the contents of the boxes are varied, with the odd unpredictable or unusual item in there to keep things interesting. The price is about right for organic, and the box I tried felt like good value for money. Organic food is more expensive, but it’s better for both you and the environment, and it tastes good. Worth the premium. Good food, good quality, good price, good value. * Abel & Cole sent me this box free of charge, for the purposes of this review. Thanks very much indeed. Veg boxes are a great way of getting your 5 a day, but it pays to shop around for a supplier – shopping local can be better value: I get a similar sized veg box from a local farm for only £12. They grow all their own vegetables (only fruit is bought in, there not being many organic citrus growers in North Yorkshire! ), on a farm that's only 12 miles from my front door. Really interesting findings. It's surprising how much people actually spend on fruit and veg in the supermarkets, and how they could better quality, local food, for a relatively similar price. 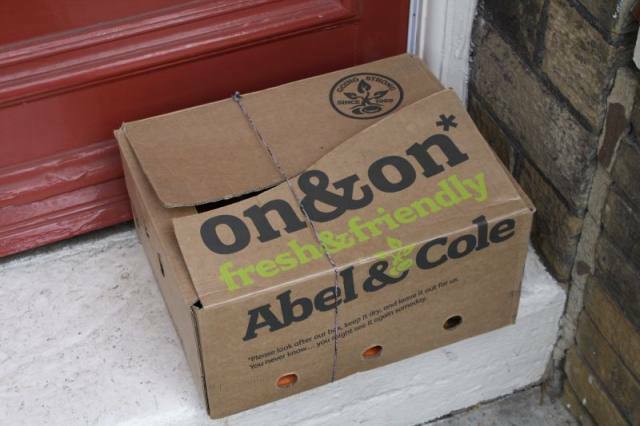 There is a veg box scheme in Nottingham offering veg boxes for between £3.50 and £10, which definitely would give Abel and Cole a run for its money. You can read more about them here. I have been using Abel and Cole for about 18 months now……I gave up on the ‘boxs’ because we just didnt use all ths contents. I continued ordering just the veg, fruit and meat we wanted…….Yesterday, my wife pointed out that I was paying GBP5.60 for two red peppers!!!! I appreciate this is my fault….and that the peppers were nice…..but how can they sell red peppers for more than meat?